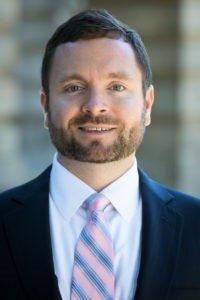 RALEIGH, N.C. – Shanahan Law Group, PLLC is proud to announce that John E. Branch, III was appointed to serve as Chairman of the North Carolina State Ethics Commission by Governor Pat McCrory on December 29, 2016. Branch will fill the unexpired term of Justice George Wainwright, Jr. continuing until December 31, 2017. “I am honored and humbled by the appointment, and will serve the citizens of the State of North Carolina to the best of my ability,” Branch said. The Ethics Commission is responsible for administering and enforcing the State Government Ethics Act, as well as for interpreting North Carolina’s lobbying law and receiving certain complaints made against legislators, legislative employees, and other state employees. As a result of serving as Chairman of the Ethics Commission, Branch now serves as Chairman of the Bipartisan State Board of Elections and Ethics Enforcement, which is responsible not only for the duties and responsibilities of the former Ethics Commission but also for those of the former North Carolina State Board of Elections, including general supervision over the primaries and general elections in North Carolina. Shanahan Law Group and Branch have significant experience in handling election law matters, including advising federal and state candidates, candidate committees, and other individuals and entities in connection with federal and state elections. Shanahan Law Group is a boutique law firm in Raleigh, North Carolina that offers a full range of business and litigation services. The firm’s practice areas include complex business litigation, business formation and exit strategies, banking and financial institutions, licensing and distribution, real estate and construction, secured transactions, property rights, election law, employment law, white collar criminal defense, trust and estates, and government representation. The firm has offices in downtown Raleigh and North Raleigh. For more information, call (919) 856-9494 or visit https://shanahanlawgroup.com.